A single DSB, if left unrepaired, is lethal in cells. Thus, complex systems have evolved to rapidly detect and repair these lesions. HR and NHEJ represent the two major DSB repair pathways in mammalian cells. While homologous recombination (HR) utilizes homologous DNA sequences as a template for repair, non-homologous end joining (NHEJ) processes and re-ligates the exposed DNA termini of DSBs. NHEJ is considered more error prone than HR and is the predominant pathway in the G0/G1-phases of the cell cycle. Key NHEJ proteins include DNA-dependent protein kinase catalytic subunit (DNA-PKcs), the Ku70 and Ku80 heterodimer, X-ray cross-complementing-4 (XRCC4), and Ligase IV (LigIV). HR increases during S/G2, when a sister chromatid is available as a repair template. Examples of key HR proteins include breast cancer 1 early onset (BRCA1), BRCA2 and Rad51. 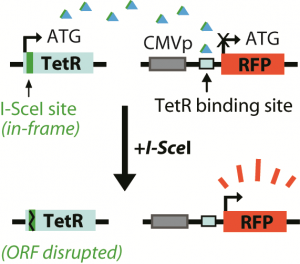 These two pathways play a critical role in the response to IR in mammalian cells, as highlighted by the exquisite radiosensitivity of cells isolated from patients with inherited defects in DSB repair genes. 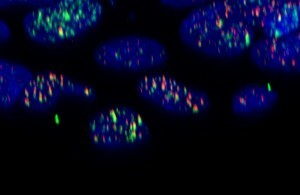 Photo 1 shows a 3D representation of BRCA1 (green) and DNA-PK (red) repair proteins forming at DSBs immediately after IR (DNA in the nucleus stained blue with DAPI), as imaged by confocal microscopy. Our laboratory has also developed novel tools to measure NHEJ and HR in living cells. One example is shown in Photo 2. We use these assays to study the competition between NHEJ and HR in mammalian cells.